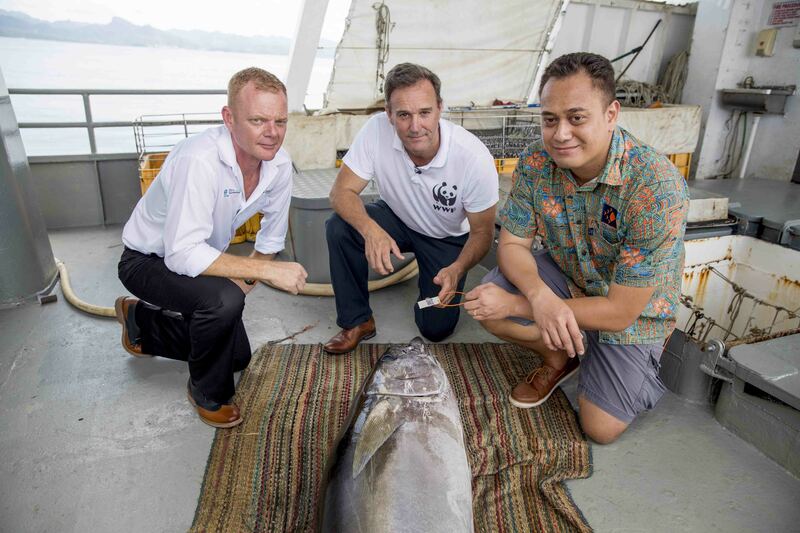 Brett “Blu” Heywood, SeaQuest Fiji CEO, Dermot O'Gorman WWF-Australia CEO and Ken Katafono, TraSeable Solutions CEO next to a yellowfin tuna about to be tagged with QR code. Fiji waters, December 2017. In December 2017, WWF-Australia, WWF-New Zealand, WWF-Fiji, TraSeable Solution and SeaQuest Fiji went to Walu Bay, Suva in Fiji to see the beginnings of a new innovation project. WWF-Australia and WWF-Fiji have teamed with Consensys and SeaQuest Fiji to stamp out illegal fishing and human rights abuses in the Pacific tuna fishing industry. WWF is implementing a “bait to plate” solution that uses blockchain technology, combined with mobile RFID and QR technology, to provide a transparent and sustainable trusted chain of custody from the fish caught in the ocean, processed, and right through to the shopper and consumer. WWF and its partners have introduced revolutionary blockchain technology to the Pacific Islands’ tuna industry, the first of its kind for this region, to help stamp out illegal fishing and human rights abuses. For years there have been disturbing reports that consumers may have unknowingly bought tuna from illegal, unreported and unregulated fishing and, even worse, from operators who use slave labour. But blockchain technology means that soon a simple scan of tuna packaging using a smartphone app will reveal where and when the fish was caught, by which vessel and fishing method. Consumers will have certainty that they’re buying legally-caught, sustainable tuna with no slave labour or oppressive conditions involved. Blockchain technology is a digital, tamper-proof record of information that is accessible to everyone. As part of an innovative initiative, WWF-Australia, WWF-Fiji and WWF-New Zealand have teamed up with global tech innovator ConsenSys, information and communications technology (ICT) implementer TraSeable, and tuna fishing and processing company Sea Quest Fiji Ltd. to deliver the project. Sea Quest Fiji has been assisted to use blockchain technology, for the first time in the Pacific Island tuna industry, to track its tuna from the vessel to the processing facility to the distributor. Now steps are underway to find a retailer to partner in the project and use blockchain to complete the tuna’s traceability story. The appeal for a retailer is that their customers could scan a QR code with their smartphone and, for the first time, trace tuna products all the way from ‘bait to plate’ using blockchain technology that creates a “single version of the truth”. In the past, firms relied on traditional web or paper based technologies to provide traceability. But this Blockchain system is immutable, verifiable, and unalterable. It’s believed consumers will favour tuna products with this advanced level of transparency so that eventually the whole tuna industry adopts the blockchain technology, in turn squeezing out the illegal operators. “Ridding the industry of these sorts of unsustainable practices will help protect fishers from human rights abuses and save the environment. “It’s a very exciting revolution that’s about to transform the industry and that will deliver multiple sustainable development goals,” he said. “Sustainable fishing ensures the longevity of the fishing business, and Sea Quest wants to see sustainable fishing in the region. This blockchain project with the three WWF offices certainly gives the industry the best opportunity going forward,” Mr Haywood said. Blockchain is being increasingly adopted by major corporations as organisations seek to develop applications that make the most of its unique attributes for security and accessibility. ConsenSys’ Viant, a blockchain supply chain platform, has just announced collaborations to accelerate the deployment of blockchain-based supply chain systems with innovative global companies including WWF, Microsoft, GlaxoSmithKline and Imaginea.